C. Considius Paetus was one of the moneyers for the year 46 BC. He is not otherwise known. Gens Considia was a plebeian family at Rome. None of the members of this gens ever obtained any higher office in the state than the praetorship, and are, with one exception, mentioned only in the last century of the Republic. 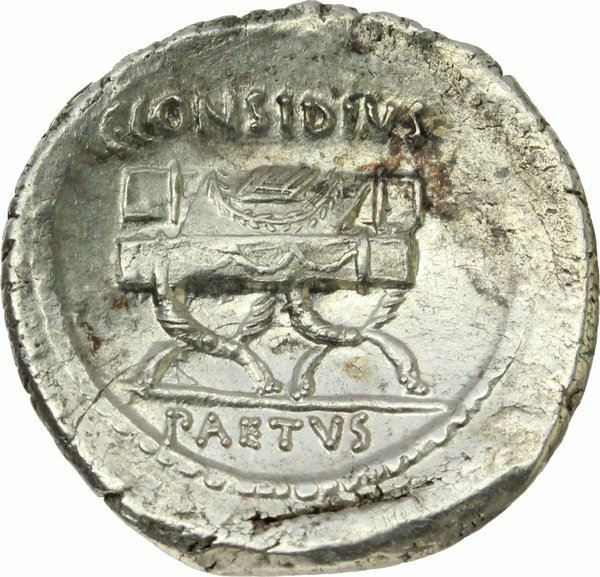 The cognomina of this gens are Gallus, Longus, Nonianus, and Paetus, the last two of which also occur on coins. Gallus may refer to a Gaul, or to a cockerel. Longus implies that the bearer was tall, or perhaps "long-winded," although the name could also have been bestowed ironically on a short man. Nonianus implies a connection with the gens Nonia, although whether the individual bearing it was adopted from that family, or descended from it through the maternal line, cannot be determined. Paetus translates as "squinty" or "nearsighted."